More than 60,000 veterans live on America’s streets. Susan Angell, Mark Johnston and their interagency team are making major strides toward ending this national disgrace by 2015. The goal is challenging given the high national unemployment rate and the influx of individuals returning from Iraq and Afghanistan, but the Department of Housing and Urban Development (HUD) and the Department of Veterans Affairs (VA) have joined forces and made significant inroads. The two federal departments reported a 12 percent drop in homelessness among veterans, from about 76,000 in 2010 to 67,000, as of January 2011. 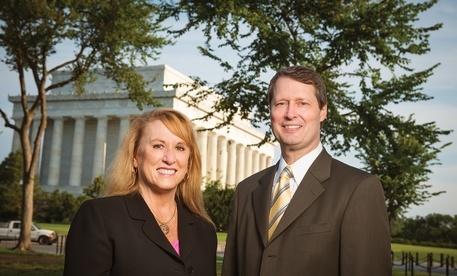 As leaders of the joint endeavor, Johnston at HUD and Angell at the VA, possess significant management skills, knowledge about housing and the needs of veterans. Angell’s team includes Peter Dougherty, Lisa Pape and Vincent Kane, while Johnston’s includes Ann Oliva and Laure Rawson, among others. The collaboration has allowed both departments to devote their expertise and resources to a problem that neither could solve alone. The two departments administer the HUD-VA Supportive Housing Program (HUD-VASH), which combines HUD vouchers that provide assistance for veterans to rent privately-owned housing, and targeted VA case management services such as health care, mental health and substance abuse treatment, vocational assistance, job development and placement. The program works with public agencies and community organizations across the country to implement many of the targeted interventions needed to assist veterans. Through the HUD and VA partnership, there are currently more than 30,000 formerly homeless veterans and their families now receiving housing and support services. For fiscal year 2012, Congress has approved an additional 10,000 housing vouchers for homeless veterans that will allow the program to expand and come closer to reaching its goal. This is the seventh in a series of profiles featuring the recipients of the 2012 Samuel J. Heyman Service to America Medals. Presented to outstanding public servants by the nonprofit Partnership for Public Service, and sponsored in part by Bloomberg, Booz Allen Hamilton, The Boston Consulting Group, Chevron and United Technologies Corporation, the prestigious Sammies awards are offered in nine categories. To nominate a federal employee for a 2013 medal go to servicetoamericamedals.org. Previous Post | Nerd Camp! A Solution to the Dwindling Cybersecurity Workforce? The Partnership for Public Service works to revitalize the federal government by inspiring a new generation to serve and by transforming the way government works. Visit ourpublicservice.org for more information.